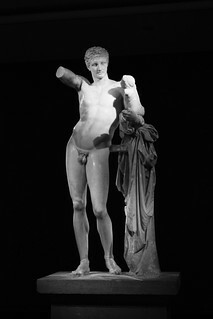 Hermes was first discovered in 1937 by Karl Reinmuth in Germany, but then was lost for a while and rediscovered in 2003. The Greek god Hermes is the Roman god Mercury, so asteroid Hermes is very similar to Mercury (pretty funny it was lost for a while then!). Hermes was the was the god of thieves, commerce, shepherds, liars, and travelers (some of those seem worse than others, eh?). Astrologically, according to Mark Andrew Holmes, Hermes seems to have something to do with cleverness, intelligence, divisiveness, division, and occultism. My Hermes is in Capricorn and my 2nd house. I try to be clever with my resources and goals? Actually, it can show professionally (Capricorn) making money (2nd house) off of the occult (Hermes) - ha! Hermes is square my Mercury (so I better watch my tongue), Deucalion (I can be clever with change? ), Apollo (if I don't take it for granted), and Achilles (or let it be my downfall). On astro.com, Hermes is number 69230. In transit, Hermes can show where you'll need to have some of that quick wit and sharp intelligence. To find where Hermes currently is located you can use astro.com (go to extended chart selection, then click on ephemeris, and type 1862 in the additional asteroids and other objects section). Hermes is currently in Leo and square my Saturn, ruler of my 3rd house - gotta watch what I say!